Backed with 30 years of experience, Marketing Genome guarantees high-level brand experiences through custom exhibits, events, and experiential marketing campaigns to connect with audiences. Since 2010, MG has been creating experiences and real life movie moments across the country from its original office in New Jersey all the way over to its second location on the west coast. MG was one of the first production companies that helped integrate our setup into the booth in a way that looked planned into the overall experience as opposed to an “add on.” It’s hardly an event without a photo booth so we asked MG their thoughts on the impact of photo activations and experiences as well as where they think the future is. “Photo booths continue to be a very integral part of [trade show] booths like New York and San Diego Comic Con,” says Lou Ross, director of marketing at Marketing Genome. Ross notes that these booths create brand awareness, engagement, and involvement by breaking up space and monotony. They create brand advocates and fans, adding to the possibility of future sales. Booths leave attendees with memories for themselves to later tell their friends about. One of the company’s main goals is to create unique trade shows that pique interest. Fortunately for MG’s unique booths, just seeing one can spark curiosity and create a chain reaction. According to Ross, “the larger the line, the faster the crowd builds.” With that said however, it is crucial for the experience to be executed correctly to deliver the expected experience. Negative word of mouth can be detrimental. Photo booths however, are evolving and will continue to do so. Tech advances like 360 Photos, Virtual Reality, and 3D printing aren’t replacing photo booths, they’re paired together to create physical sets and activations that go beyond simply capturing a moment. They’re immersing attendees in an environment and giving them real time experience. At NYCC in 2015, Marketing Genome did just that by creating a full-scale Jurassic World set replica of the gates leading into the park. The over the top custom experiential display, complete with an animatronic Raptor, smoke machines, and live fauna, quickly became the most photographed display in the entire show. 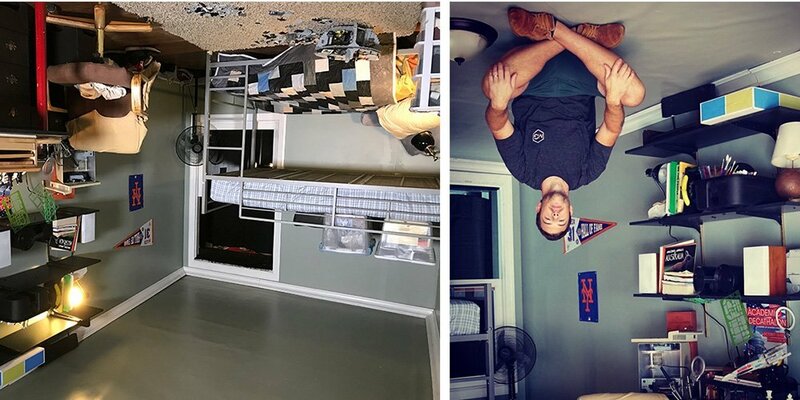 Earlier this month, they did it again at this year’s NYCC with an exact replica of Peter Parker’s bedroom from Spider-Man Homecoming. Attendees entered the upside-down designed room and posed like Spider-Man himself. If the crowds had any indication of the booths’ success, then both were incredibly effective. We’ve been able to see MG’s work first-hand over the years, partnering at a number of entertainment-related events across the country. These events included NYCC, SDCC, GenCon, and PAX with clients such as Konami, Loot Crate, and Project TriForce. Collaborating for over 5 years, we’re always impressed by MG’s quality and innovation in their booth builds. We look forward to hearing about the next big thing they’ll be doing and hope for many more years of partnership.